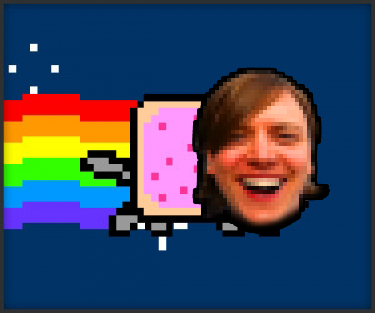 From 2007 to 2009 I was CEO of an internet games startup. We transformed surfing the web into a massively-multiplayer online game called PMOG/TheNethernet. It was free-to-play with over 120,000 registered players, but no one wanted to pay into our game in a Firefox toolbar. That company, GameLayers, didn't survive. I took a few months to interview at gaming and web content companies and ended up heading towards ngmoco:) - a mobile games company. I had known one of ngmoco:)'s four founders, Alan Yu, for many years from game industry conferences. ngmoco:) seemed to be alive with potential to make success on the iPhone, a promising new games platform. Since I'd been a mobile games journalist from 2000-2004 so ngmoco:) seemed like a natural place for me to study how commercially viable entertainment software is built. I started off as a mobile games producer, working on the Touch Pets franchise. 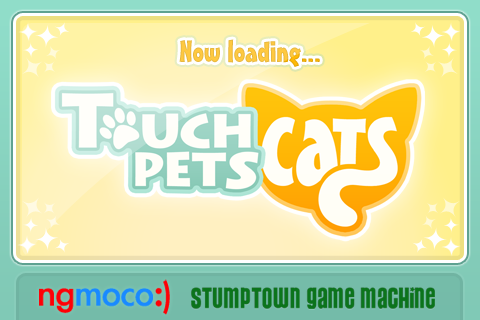 With the Stumptown Game Machine team, we put Touch Pets Cats live on the iPhone in November 2010. Ryan Junell made a fantastic fun Touch Pets Cats trailer. In November 2010, Touch Pets Cats peaked at #2 free in the US iPhone charts, and #8 on top grossing, largely because ngmoco:)'s more successful game We Rule sent traffic over our way. In the fall of 2010, ngmoco:) was purchased by a titan of Japanese mobile social gaming called DeNA (from "eCommerce is in our DNA"). Ten years after I moved to Japan covering mobile phone games as a reporter, I now worked for a mobile phone game. It was also the first time in sixteen years of working with internet companies that my stock options had become worth something and I had a financial reason to stick around longer term. I started producing a location-based mobile game for ngmoco:), and in my spare time, I started producing a company newsletter (much like I had at my last job at gamers.com). In early 2011, the company asked me to shift from game production to Culture & Communications. 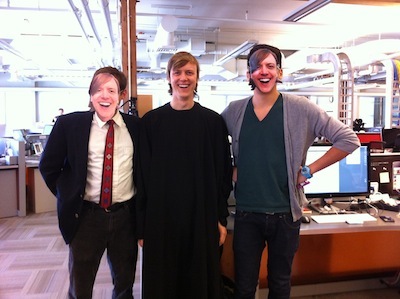 Immensely surreal moment: colleagues John O'Neill and Tim Shundo wear my face for Halloween 2011. From 2011 to 2013 I was the Director of Culture & Communications at ngmoco:) / DeNA Americas & Europe. I produced newsletters, videos, innovation events, onboarding, knowledge sharing, events - all manner of stuff I have documented in this overlong work-in-progress culture writeup. The Wall Street Journal published my picture and some remarks in November 2011 "For Tech's Elite, Mobile Gaming Is a Big Play". 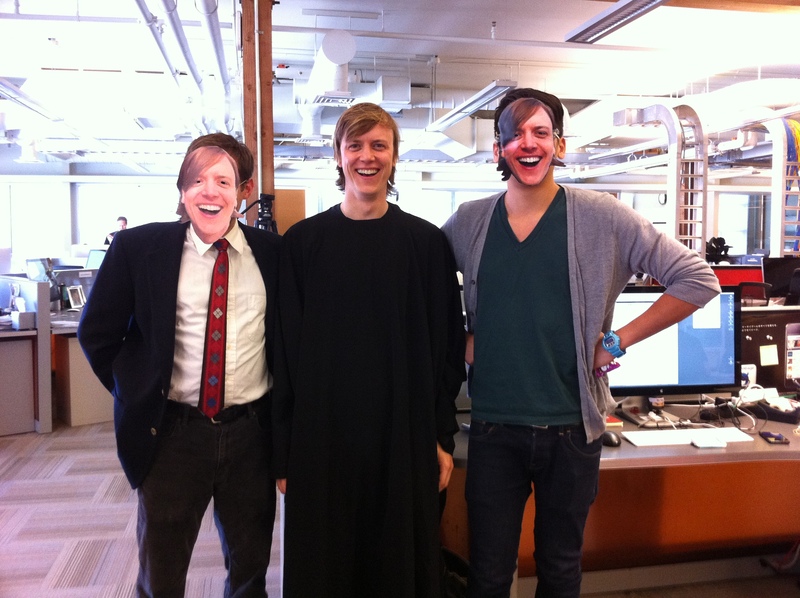 Hor Halloween in 2011, a number of folks photoshopped my face onto pictures. Hah! I was tickled and honored. In January 2013, my boss at DeNA, Jen the head of HR, said: "you're good at telling the story of the company inside the company. How about if you tell the story of the company outside the company, as a recruiter?" I enjoyed having my own domain as head of culture, but I relish a new challenge and the chance to learn. So, in February 2013, I became a Recruiter for DeNA. I learned about recruiting until June 2013, when I left ngmoco:)/DeNA to focus on making videos instead - The Justin Hall Show.